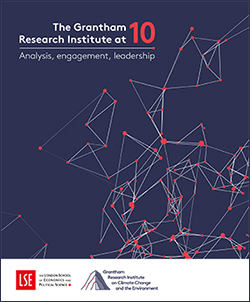 The Grantham Research Institute is celebrating its 10th anniversary throughout autumn 2018. To mark the occasion we have produced a publication looking back over some of the key impacts we have made in the past 10 years and another which looks forward to our priorities in the coming years. In addition we have a number of events planned around the 10th anniversary. Since its inception in 2008, the Grantham Research Institute has established a world-leading reputation for research and policy analysis on environmental problems, with a focus on climate change. This publication reviews the highlights of the last 10 years in key research areas and describes how aspects of this work will be extended. Institute staff describe the impacts of their work, from contributing to international negotiations and carbon market reform to building a unique knowledge resource on climate laws and informing decision-making on resilience in developing countries. The publication features testimonials from prominent figures in the fight against climate change, from governments, international institutions and academia, as well as Institute alumni who have gone on to develop their work in particularly interesting and influential directions. The next five to 10 years will determine whether or not the world makes a successful transition to inclusive, sustainable growth. 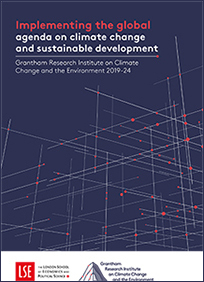 In this pamphlet the Grantham Research Institute sets out how it will provide businesses and governments with the research and analysis they need to make better informed decisions about climate action and sustainable development. It presents the Institute’s priorities for 2019–24 in the areas of academic research, policy analysis, and engagement with decision-makers. The Grantham Research Institute at 10: What next for international climate action?